Everyone has a passion. Something they feel strongly about. 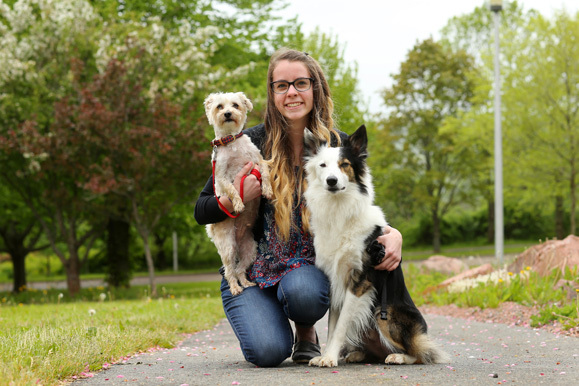 For second year Animal Science student Amy Harrington, it’s animals. Amy joined 4-H ten years ago and the rest is history. “I started out in cake decorating but I really love animals and finally convinced my mom to let me take the goat showmanship project instead. Once she found out you are able to borrow another person's goat and don’t have to own one yourself, she was on board,” Amy laughed. Amy had so much fun showing and training her goat that she eventually moved on to the dog obedience project, which she has been doing for the last five years. Through this project, Amy has gone to Pro Show three times for dog showmanship and won first place overall at the provincial level. Through the show, she traveled to exhibitions and smaller venues to perform in front of audiences with frisbee, relay races, free style routines and obedience routines. Amy was recently selected by Uniterra as one of 30 student-leaders from Canada and Tanzania to participate in an International Seminar for five weeks this summer in Arusha, Tanzania. A native of Debert, Nova Scotia Amy will be the only student participating from an Agricultural school and will be leaving her family-run blueberry farm to participate in the five- week seminar. The Uniterra International Seminar annually hosts 15 students from across Canada, alongside 15 students from Tanzania to discuss hot topics in agriculture. The subject this year revolves around technology in agriculture. For over 65 years, the Uniterra International Seminar has offered Canadian students and young professionals a unique experience to exchange and share knowledge across cultures. First initiated by WUSC in 1948, the Uniterra International Seminar connects youth across regions of the world to collaborate on a research project linked to local organizations in Africa, Latin America or Asia. Traveling over 11,000 kilometers from Nova Scotia to Tanzania, is a daunting task, but Amy is up for the challenge.